Pink House Gallery, Old Slave Mart Museum. French Quarter and South of Broad Maps, South of Broad Mansions, Miles Brewton House, Two Meeting Street Inn, Calhoun Mansion, First (Scots) Presbyterian Church, George Washington Park, Circular Congregational Church, Horse-drawn Carriages. Day 3, Part 1 Magnolia Gardens Plantation: Beautiful flowers, huge live oaks and cypress trees hung with Spanish Moss, black reflecting marsh ponds, signature plantation bridge. Day 3, Part 2 Magnolia Gardens Plantation: Slave quarters, alligator in marsh, across marsh reeds to the woods, moss close-up, magnificently spreading tree, plantation mansion from several angles, expansive views from its veranda. 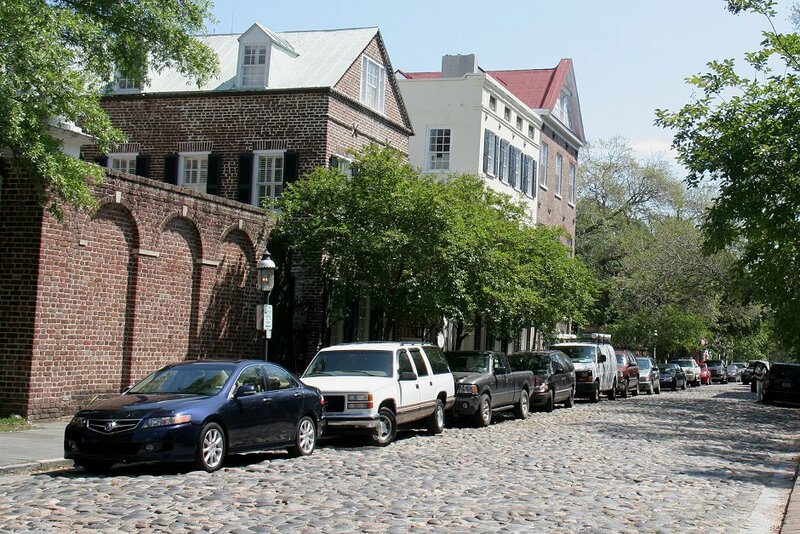 South of Broad Map, Cemetery at St. Michael's Episcopal Church, First (Scots) Presbyterian Church, Tourists in carriages, Calhoun House alley, Huge tree at Two Meeting Street Inn, West Point Gardens: Gazebo, Cannons, 1775 Army of Revolution Monument, Massive array of sailboats. The pictures used here from Days 1, 2 and 4 were also created in much larger size for use in a full-screen video slide show. Click on the link below to see this 7-minute show. Or move on to the web page coverage here and come back to this spot later to view the slide show after you are more familiar with the details provided only on these web pages. in Full Screen, 7 min. Computers, iPads, iPods, etc. 7 min. 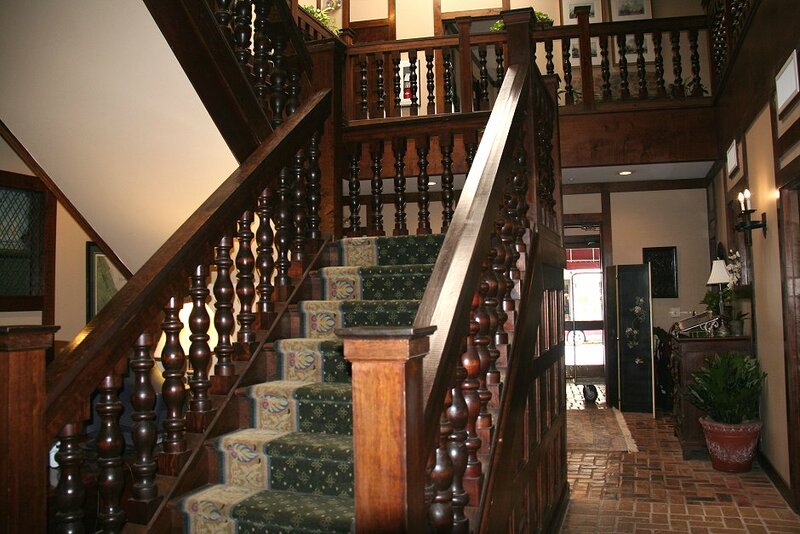 Anchorage Inn, within walking distance to most of the interesting things in the historic district, and two blocks from beautiful Waterfront Park. Very friendly and helpful staff (all Black, except the general manager), with breakfast and evening wine and snacks included. Examples of the helpful staff: a) We arrived in the late evening with almost all of our clothes dirty after being on the road for 9 days with no laundermat available. Katima, the receptionist and concierge at the desk, offered to wash our clothes the next morning, which she did and returned the clothes neatly in a bag. b) Later that day Mary and I took a bus tour of the city and I left my wallet wedged in our seat on the bus. I discovered the loss when we returned to the hotel and was devastated. Once again I took my troubles to this wonderful woman. Before we had finished our wine and snacks in the hotel living room, "Tima" had called the tour company (several times), arranged for them to find and bring my wallet to the hotel, and presented it to me as Mary, I, and other guests sat mulling over my misfortune. I hope I didn't hurt her as I jumped up and gave her a long hug. When we were alone later that evening, I gave her a $20 bill -- probably not enough. 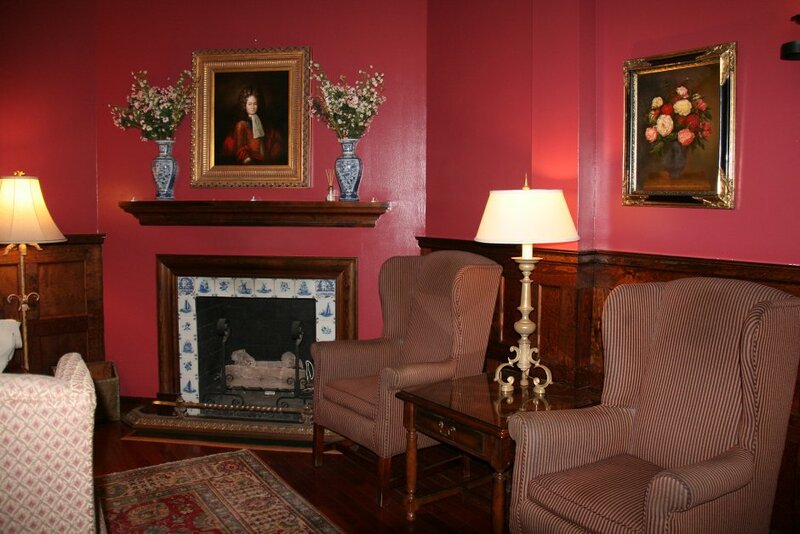 This is the front desk of the inn, where Tima was sitting when we arrived late in the evening of April 16th. She traded off with the woman in this photo throughout our stay. I actually took these pictures on the day we were leaving while waiting for a cab back to the train station for our final Amtrak leg, to Savannah. Behind the wall at the desk is a staircase to the upper bedrooms. View toward the front door and front desk in the above picture. Our room is in the upper right corner of this photo, with a nice view over Vendue Range St. 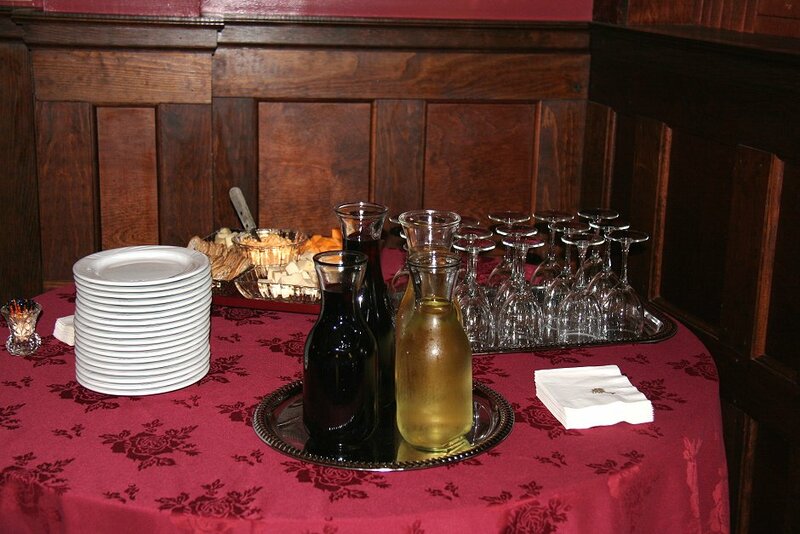 Typical set-up of wine, crackers and cheese at 5 p.m. each evening. our plans for the evening and interesting things we saw or did that might help others. 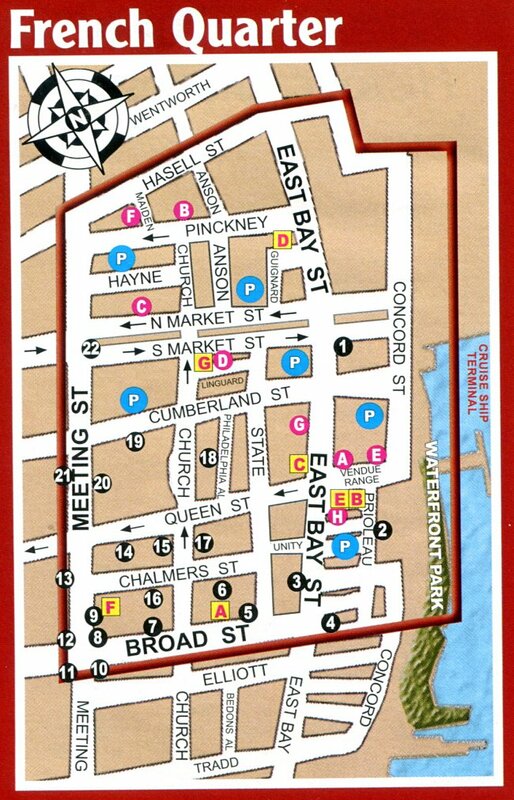 Anchorage Inn is in the French Quarter, and is indicated by the red circled A in this map. We did all our walking in and near this area. Note how Queen Street is an extension of Vendue Range where the Anchorage Inn is located. 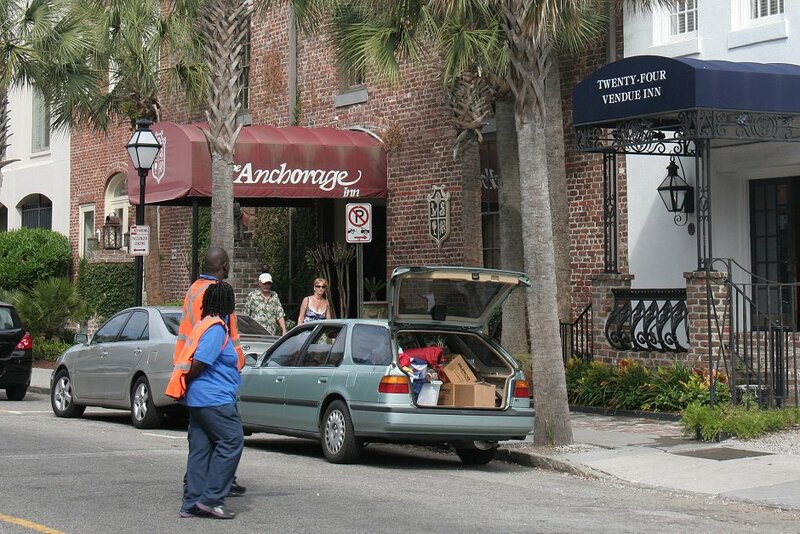 We spent our first day visiting Waterfront Park to the east of Anchorage Inn, followed by a walk west on Queen St. to Meeting St. (the main street of Historic Charleston), south one block to Chalmers St., and then east on Chalmers to East Bay St and back to Anchorage Inn. We walked to dinner the first evening at Fleet Landing sea food restaurant on the water just north of Waterfront Park. 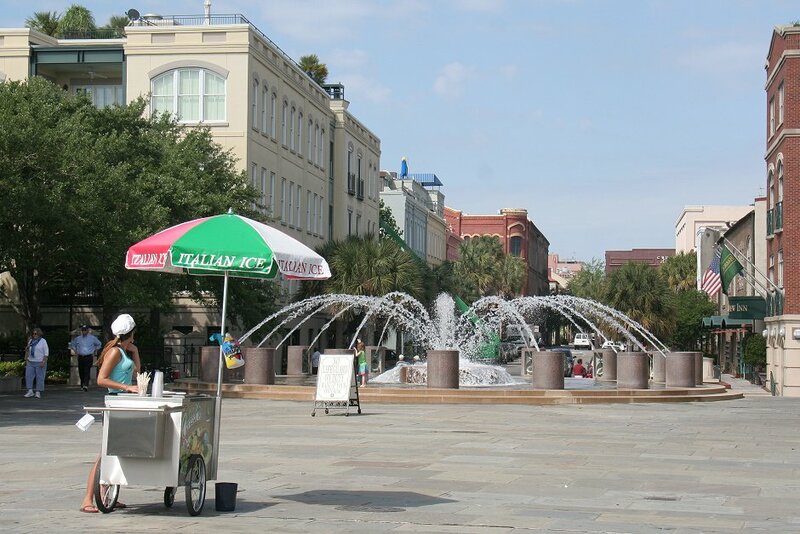 View back toward our Inn (just out of sight on the right) from Waterfront Park, with its fountain in the foreground. 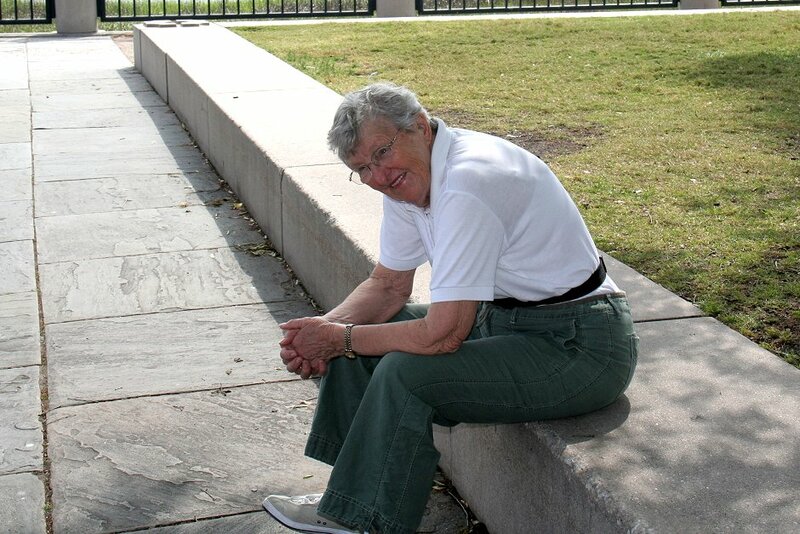 Mary looks back at me while I chat with a young mother and her two children. 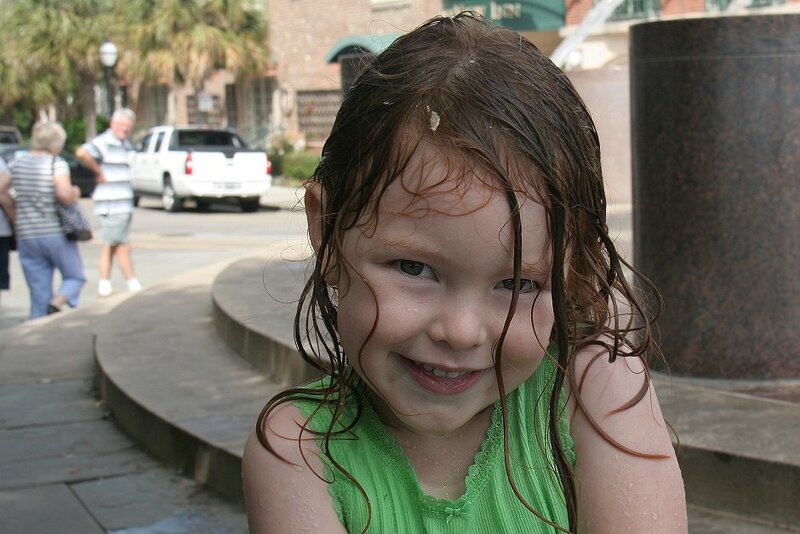 One of her children -- couldn't resist photographing this smile after she played in the fountain. 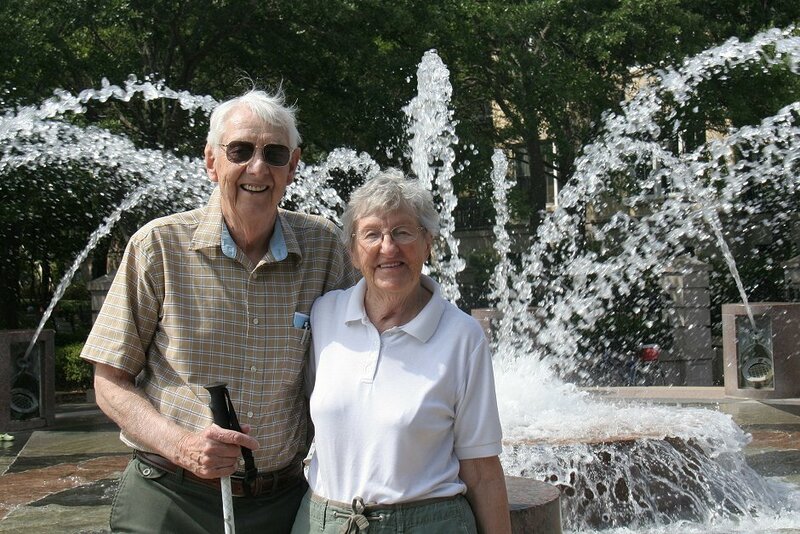 A kind soul photographed Mary and me at the fountain. 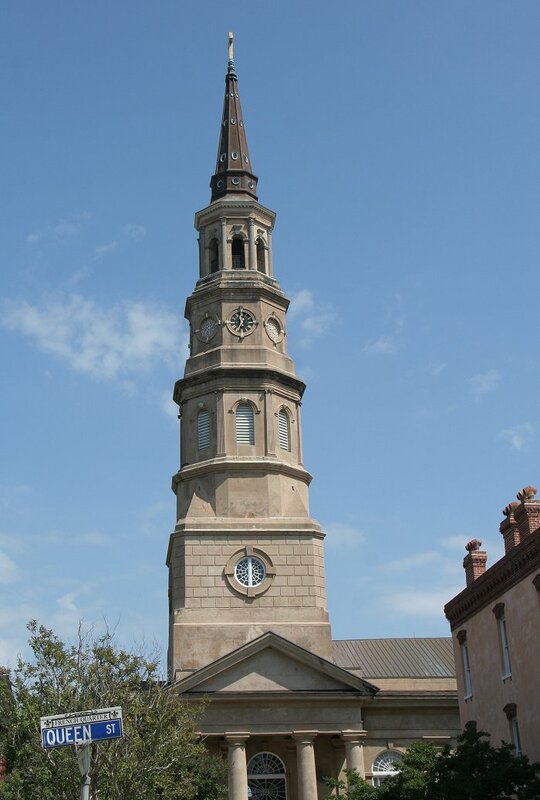 As we walked west on Queen Street, extending from Vendue Range Street, we were struck by the beauty of St. Philip's Episcopal Church seen up Church Street. 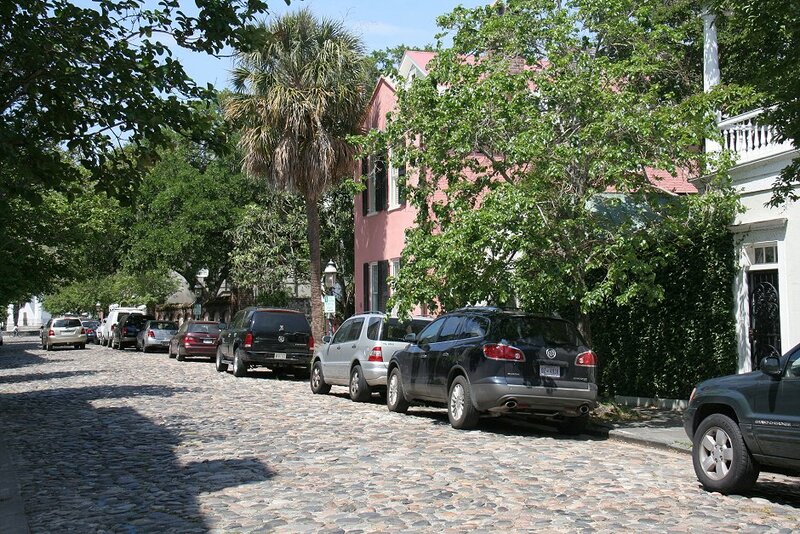 told is the only remaining cobblestone street in Charleston. Another view of the street as we walked back toward Anchorage Inn. A view in the other direction after walking farther toward Bay St. 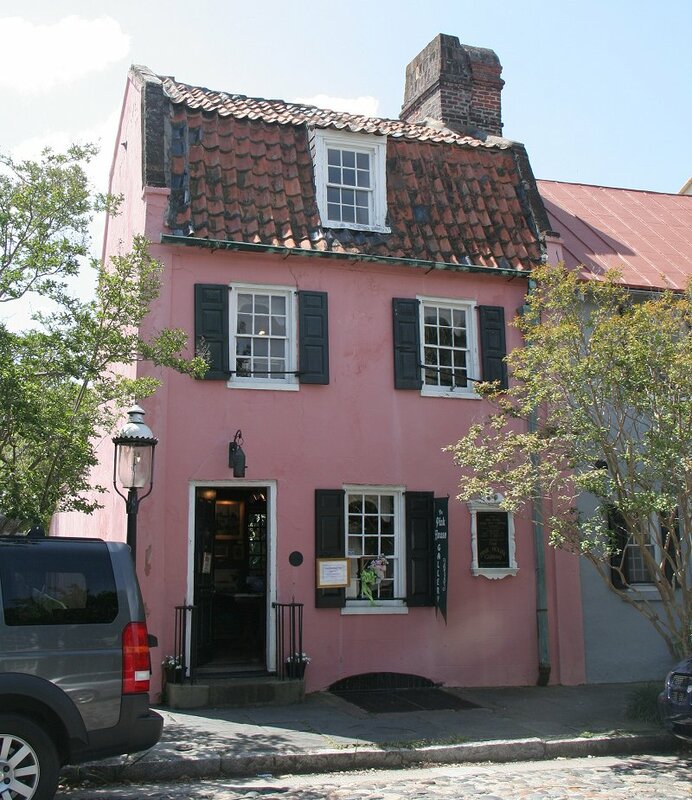 Still on Chalmers St., this is the oldest building in Charleston, circa 1690, now the Pink House Gallery. 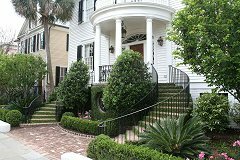 The 1808 ban on the United States' participation in the international slave trade led to a renewed demand for slave labor, which was satisfied, in part, by the creation of a domestic slave-trading system in which Charleston functioned as a major slave collecting and reselling center. 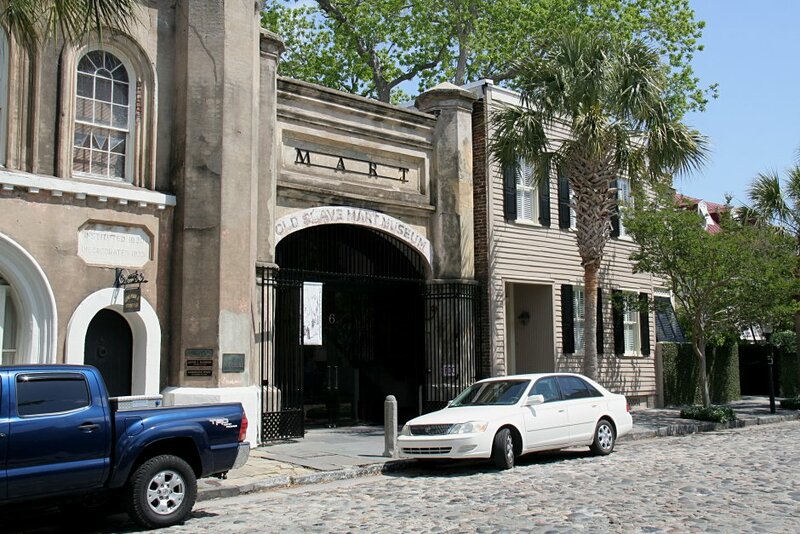 The Old Slave Mart Museum, located at 6 Chalmers Street, recounts the story of Charleston's role in this inter-state slave trade by focusing on the history of this particular building and site and the slave sales that occurred here. 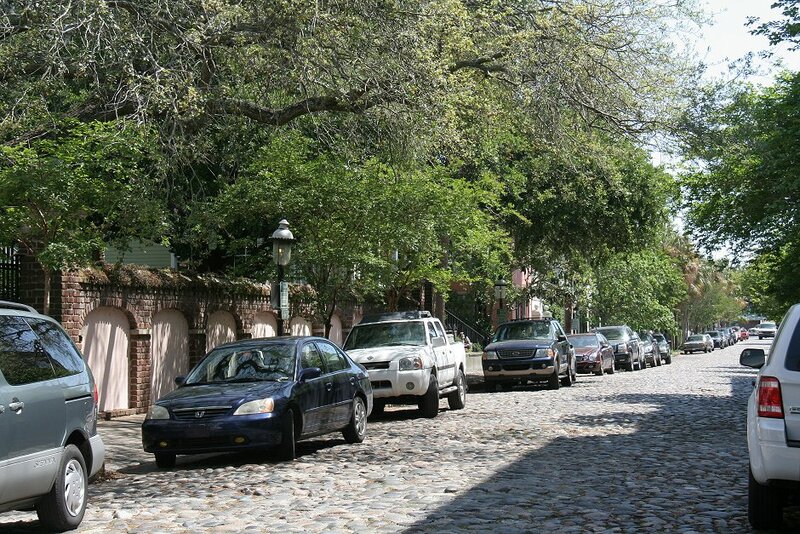 Later on this first day we took a bus tour of greater Charleston to get a global feel for the area. I remember bits and pieces from the tour but nothing that I can describe in a useful narrative. The bus wandered around the Citadel for quite some time, so I do remember its unique architecture (every building had turrets like a medieval castle) and that most of the students do not plan on a military career but sign on for the rigorous training. The 7-min video below does an excellent job of describing the facilities, activities, and mood of life in the Citadel, with only great music and video. I recommend clicking to full screen, and even 720p if you have a good Internet connection.